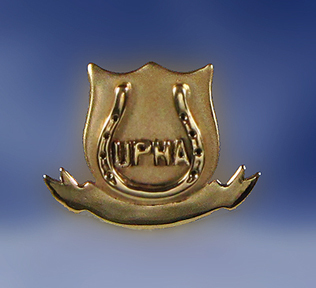 UPHA member pins. The Gorgeous Horse is your source for custom logo's for any association, farm, or business. Let's get started on your logo today and email us to find out how we can give back to your association. Dedicated UPHA members only pin. When you order this pin proceeds of the profit are given back to your association to show your support and dedication as a valued member. You must be a current member to purchase the pin and have your member number ready, add your number to the end of your last name in the checkout to complete your order. We cannot process your order without your member number! PICTURED AND PRICED IN 14KT YELLOW GOLD!